Black Friday Sale Continues with Hot Goods Available! Enjoy the Black Friday Bonanza! 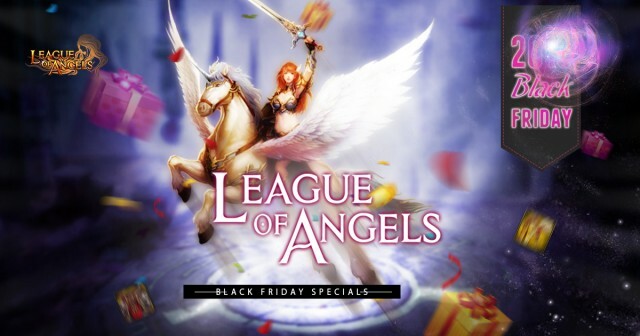 From Nov. 28th to Nov. 30th, League of Angels will still be offering tons of amazing items at insane discounts for all players. Whether you want to summon sylphs, equip your heroes or simply gain resources, you can do that via the crazy sale. Plus, there’s a chance to win a 99% rebate on what you paid, making your entire purchase essentially FREE! When you want to change the battle skin freely, sylphs will be an essential! From Nov. 29th to Nov.30th(server time), Lannister, Moonlight Spirit and Saintly Queen will all show up! Don't forget to check them out in Hot Events! Choose a new suit and triumph over your enemies! The Cowboy Fashion and Pirate Costume will greatly increase your battle rating. Carve inscriptions onto the amulets, and the amulets will make your heroes even stronger. Death Howl, Thunder Axe, Bloody Chalice and valuable inscriptions can be easily gained in Hot Events! Hurry up! Additionally, you can find more heroes and sylphs in House of Cards from Nov. 28th to Dec.1st(server time). We hope all players will enjoy the bonanza and explore more ways to play the game!